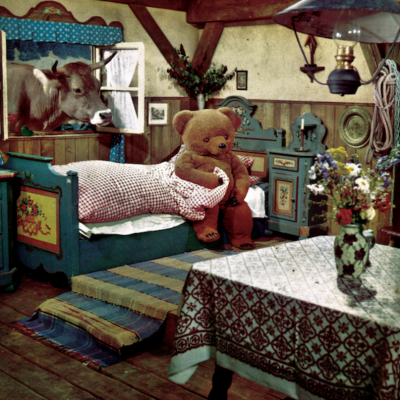 “If you want to see a dead body take off your clothes.” So ends “Animal Rites,” the first song on producer John Congleton’s new electro-pop record, Until the Horror Goes. I hesitate slightly to use the word “pop” to describe this album, because although I think it’s accurate to call this an electro-pop album, it doesn’t have too much in common with acts like Chvrches or Purity Ring. The requisite synthesizers and pop-song structures are all there, but while a group like Chvrches is euphoric and beautiful, Congleton has created music that is harsh, morose and filled with existential dread. Congleton is most familiar to me as the producer of award-winningly beautiful and expansive indie rock. Having worked with acts like Sigur Ros, Rubble Bucket and This Will Destroy You, I was surprised at how abrasive this album was, and how little it had in common with most of his other work that I’m familiar with. The closest his production work has come to Until the Horror Goes would probably be a cross between Chelsea Wolfe’s Abyss and St Vincent’s 2014 self-titled record, the latter of which won St Vincent a Grammy. Like both of those records, Until the Horror Goes is cold and electronic. Unlike those records, which I feel contain considerable emotional weight, this album is very fairly straight and stoic. It presents a hard exterior that is a harder to break through than something as emotionally powerful and sweeping as Abyss. To illustrate this, I’d point to the first two tracks. The album opens with blaring synthesizers and a driving drum beat, over which Congleton delivers a perverse homily about his basest urges overcoming a supposed moral code and declares throughout, “I am a bad man.” “The White Powerless” follows this up by barely letting up on the grating synths and doubling down on the nihilistic message. When he sings, “I’m cold and remote like the love of God,” it feels like a manifesto. Until the Horror Goes seems like the work of someone in a dark place, barely able to see the beauty in life over the ugliness. In the press leading up to the release, Congleton said that the record “is in some ways the musical manifestation of that screaming child rejecting the intimacy and connection for which it cries.” Pretty dark stuff, but if you dig into this record and peel back the layers of abrasiveness, there is some beauty and sweet melody to be found on this record. Beneath the dissonant strings and grinding synths on “Your Temporary Custodian” is a chorus line that I haven’t been able to get out of my head all week. Here Congleton sings, “We went looking for the sublime / We find only the inane,” which, of this central theme with the sweetest part of an otherwise incredibly abrasive record has to be on purpose. Perhaps I’m looking for something that isn’t there, but I’d like to think that a seasoned professional like Congleton is intentional about the tone of his lyrics and the music they belong to. I don’t know what that intention is, but it has stuck with me while listening to this album.